⚔ ☢ Kodenavnet på den serie amerikanske tekniske forsøg under anden verdenskrig i Manhattan projektet som resulterer i udviklingen og afprøvningen af den første atombombe i juli 1945. Forsøgene foregik på the White Sands Proving Ground, nær byen Alamogordo i delstaten New Mexico, USA. 'Denne fase af atombombeprojektet, der er ledet af generalmajor Leslie R. Groves, var under ledelse af Dr. JR Oppenheimer, teoretisk fysiker fra University of California. Han skal blive krediteret for realiseringen af atomenergi til militære formål'. / Code name of the series American technical experiments during World War II Manhattan Project that results in the development and testing of the first atomic bomb in July 1945. 'This phase of the Atomic Bomb Project, which is headed by Major General Leslie R. Groves, was under the direction of Dr. J. R. Oppenheimer, theoretical physicist of the University of California. He is to be credited with achieving the implementation of atomic energy for military purposes'. Groves s. 247. Oplysninger om forsøget er stadig skjulte eller maskerede som klassificeret information også selv om at forsøget er beskrevet detaljeret i Nuclear Weapons Testing at the Nevada Test Site, 2011. De amerikanske atomvåbenforsøg fortsatte med Operation Crossroads 1946. Se også: Atomalderen ; atomfysik. Se tillige: Operation Anvil ; Aqueduct ; Arbor ; Argus ; Bedrock ; Bowline ; Buster-Jangle ; Castle ; Chariot ; Charioteer ; Cornerstone ; Cresset ; Crossroads ; Crosstie ; Cue ; Dominic ; Dominic II ; Dugout ; Emery ; Fishbowl ; Flintlock ; Fulcrum ; Fusileer ; Greenhouse ; Grenadier ; Grommet ; Guardian ; Hardtack I ; Hardtack II ; Ivy ; Julin ; Latchkey ; Little Feller ; Mandrel ; Musketeer ; Newsreel ; Niblick ; Nougat ; Phalanx ; Plowshare ; Plumbbob ; Praetorian ; Project 56 ; Project 57 ; Project 58 ; Project 58A ; Quicksilver ; Ranger ; Redwing ; Roller Coaster ; Sandstone ; Sculpin ; Storax ; Sunbeam ; Teapot ; Tinderbox ; Toggle ; Touchstone ; Tumbler-Snapper ; Upshot-Knothole ; Whetstone ; Wigwam. National Security Archive Electronic Briefing Book No. 162. Edited by William Burr. 2007. Bainbridge, K. T.: Trinity. Los Alamos National Laboratory & United States Energy Research and Development Administration, 1976. 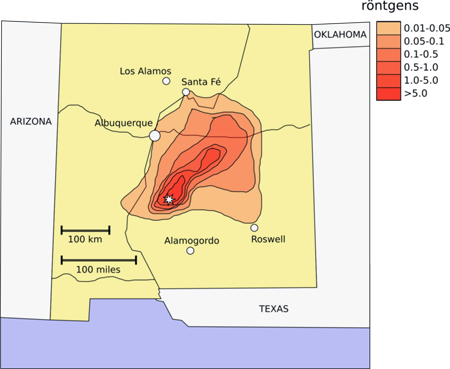 - 94 s.
Bradshaw, Jessica: Witnesses of Trinity: The first atomic bomb, July 16, 1945, New Mexico (2003). 'U.S. authorities responded in time-honored fashion to [Wilfred] Burchett's [Hiroshima] revelations: They attacked the messenger. General MacArthur ordered him expelled from Japan (the order was later rescinded), and his camera with photos of Hiroshima mysteriously vanished while he was in the hospital. U.S. officials accused Burchett of being influenced by Japanese propaganda. They scoffed at the notion of an atomic sickness. The U.S. military issued a press release right after the Hiroshima bombing that downplayed human casualties, instead emphasizing that the bombed area was the site of valuable industrial and military targets. Four days after Burchett's story splashed across front pages around the world, Major General Leslie R. Groves, director of the atomic bomb project, invited a select group of thirty reporters to New Mexico. Foremost among this group was William L. Laurence, the Pulitzer Prize-winning science reporter for The New York Times. Groves took the reporters to the site of the first atomic test. His intent was to demonstrate that no atomic radiation lingered at the site. Groves trusted Laurence to convey the military's line; the general was not disappointed. Smyth, Henry De Wolf: Atomic energy for military purposes; the official report on the development of the atomic bomb under the auspices of the United States Government, 1940-1945. - Princeton, Princeton University Press, 1945. - 298 s.
White Sands Missile Range Public Affairs Office: Trinity Site: 1945-1995. A National Historic Landmark. White Sands Missile Range, New Mexico. 1995.